You can interact with Cortana through speech or text. You can speak to Cortana, starting with the phrase “Hey Cortana” or by clicking the microphone button in her search box. 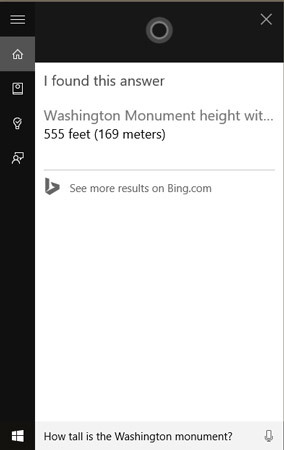 With the speech feature active, you can then state a request such as, “Open the Music App” or “What is the Diameter of the Earth?” You can also type a request in the Cortana search box. Results will vary based on how you asked the question and what the request was. 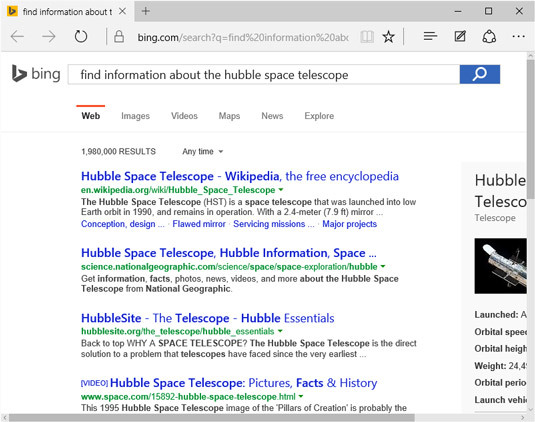 If you use speech, she may respond verbally or may display search results in the Cortana panel or in Bing. If you type a question, she won’t respond verbally, but may show you her response in the panel or in Bing. If you have requested an action, such as adding an appointment to your calendar, she may display a form in her panel that you can use to provide additional information. Over time, Cortana should learn more about you and respond more appropriately to your requests. You can also go through a procedure to help her learn your voice. 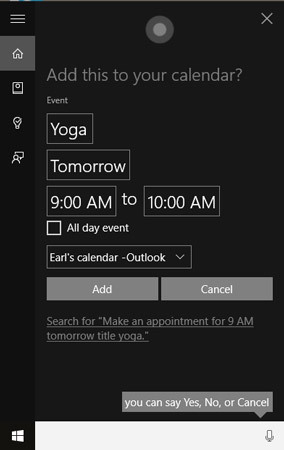 Bottom line: play around with Cortana using both speech and text and see what results she provides. Click the Add button (the + shaped button in the bottom-right of the panel) and then in the resulting panel fill in the details of what you want to be reminded to do, including the date and time. When you click a field such as People you might be taken to an app to make a choice. Click the Remind button. At the time you set to display a reminder, it appears in the bottom-right corner of the desktop. Click either the Snooze or Complete button to allow the reminder to appear a bit later or to indicate the reminder is no longer needed because the task is complete. Here is the result of this particular question. 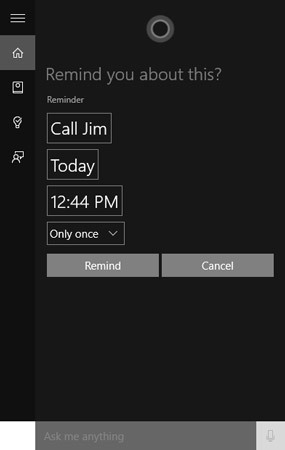 Cortana will search using Bing and return a list of matches to your request. Cortana’s results aren’t limited to facts and figures. Try asking her to find the best nearby pizza restaurant as you travel with your laptop, or to tell you a joke. You can also ask for help with using Windows 10 features. As you’re roaming around with your laptop, if you hear a song playing that you don’t recognize Cortana can identify it for you. Say, “Hey Cortana, what music is playing?” and Cortana will open in a “Listening for Music” mode. 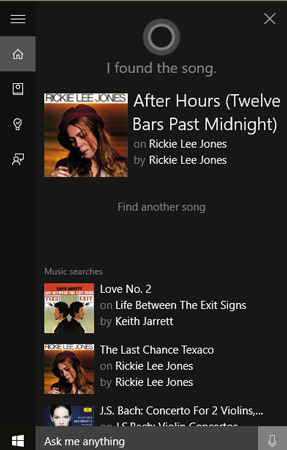 After a few moments, if she recognizes the song, Cortana provides the name of the song, album, and artist. Click on the song title and the Store opens so that you can buy the song or album if you wish.